The process of securing legal residency in the U.S. can be fraught with complexities. Serving clients in Oakland, California, our attorneys at the law firm of Bean + Lloyd LLP provide immigration assistance. Our partners are certified specialists in immigration and nationality law by The State Bar of California Board of Legal Specialization. Our team has guided people and families through a range of matters, including those involving family-based immigration, naturalization, the effects of criminal charges on immigration status, and deportation and removal. Resolute in our advocacy on our clients' behalf, we stand by those we represent throughout the process and help them to find their legal place in this country. Having more than 50 years of combined legal experience, our law firm team is committed to helping people resolve both routine and difficult immigration issues. We recognize the importance of our clients' cases to their lives and their futures, which is why we strive to help them determine the best course of action given their circumstances, needs and objectives. Our attorneys discuss clients' options with them, as well as the benefits and risks of each. It is our goal to ensure they are ready and able to make important decisions about their cases. 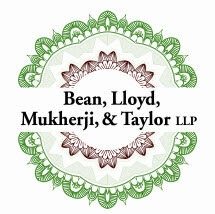 At the law firm of Bean + Lloyd LLP, our attorneys believe in building relationships on trust with those we represent. We offer our clients the supportive assistance they need while providing them with the honest guidance they deserve.